Syllabus of the Online Course (Subject): Asia Cooperation Dialogue (ACD) - The Asian Missing Link. The ACD (Asia Cooperation Dialogue) was created in 2002 in Thailand. The Asia Cooperation Dialogue is an Asian economic and political forum. The objective of the Asia Cooperation Dialogue is to set up the “missing link” in Asia by incorporating every Asian Country, and developing an Asian Community without duplicating other institutions or creating a bloc against others. The members of the Asia Cooperation Dialogue (ACD) are Bahrain, Bangladesh, Brunei Darussalam, Bhutan, Cambodia, the People's Republic of China, India, Indonesia, Iran, Japan, Kazakhstan, Korea, Kuwait, Laos, Malaysia, Mongolia, Myanmar, Pakistan, the Philippines, Oman, Qatar, Russia, Saudi Arabia, Singapore, Sri Lanka, Tajikistan, Thailand, the United Arab Emirates (UAE), Uzbekistan, and Vietnam. 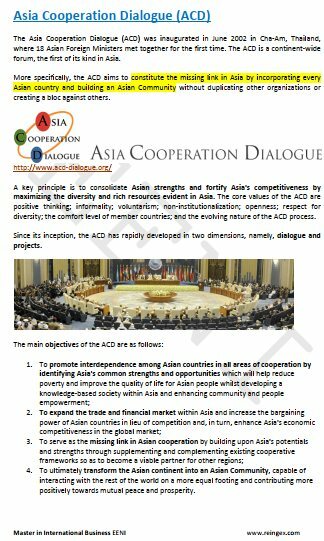 The Asia Cooperation Dialogue (ACD) belongs to Sinic-Buddhist Civilisation, Hindu Civilisation, and Islamic Civilisation.